The general's last words were: "No, Great Leader, please, it was a joke... you know... our Korean Choco Pops reminded me of the American Cocoa Puffs... I would never call the Supreme Commander of the Korean People's Army cuckoo!" North Korean leader Kim Jong-Il and Chief-of-Staff seek advice and pay homage to his father, the Great Sun, Kim Il Sung, as they re-seal the colorful plastic bag containing the Glorious Ashes. The director of North Korea's nuclear facilities is reassured by leader Kim Jong-Il that it is perfectly safe to store plutonium in a plastic bag. Kim Jong-Il, visiting the foodstuff processing factory run by Korean People's Army Unit 534, eagerly opens one bag of instant rice after another, looking for the hidden "Songun Grand Prize Lottery Ticket" promising one lucky winner a new toaster, as factory staff looking on wish their Heroic Leader greatest luck. Rice factory director Kim reassures the Great Leader that he can indeed keep the white coat. North Korean scientists, proving once again that Songun ingenuity and fighting socialist spirit triumphs over Western decadence and ignorance, impress the Dear Leader with their latest innovation, something they call the zip-lock bag. 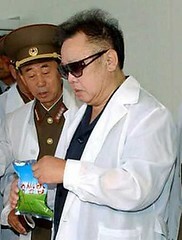 Kim Jong-Il castigates General Yong, confiscating a month's worth of his family's food rations for suggesting the Leader remove the Revered Sunglasses indoors. General Song watches remorsefully after an unfortunate comment about the Divine Sun's hair day has led to his tongue's being sealed in a plastic bag. "You say you just add water? Remarkable! Surely the American enemy possesses no such technology!" General Pyong waits patiently for leader Kim Jong-Il to figure out for himself how to open the bag as the body of General Hwang is dragged away. Of course, try Caption This to see a similar picture in the hands of an expert. // posted by AbbaGav @ 7/21/2005 12:54:00 AM | | | Permalink | EmailThis!